Christopher Bell dominated the first two stages of Saturday's UNOH 175. Despite the top-seed's strong performance, the opening race in NASCAR's Camping World Truck Series Playoff was still in question with 20 laps to go. 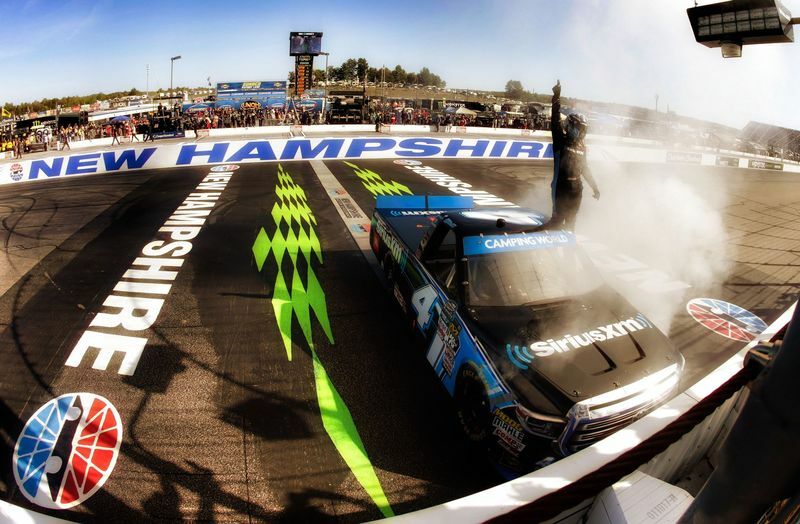 Biding his time, Bell finally made his move around Ryan Truex with 16 laps remaining and pulled away for his first-ever win at New Hampshire Motor Speedway. "He was doing a really good job watching his mirrors. It was tough to pass all day, but we just had such a fast truck that we could do it until we caught up to Ryan," said Bell, who finished second last September in his only other previous start at NHMS. "I kept trying to work down (the track) and he kept blocking my air. I got one run to go up in (Turn 1 and 2) and could get down and finally by him in Turn 3. It was a great battle." 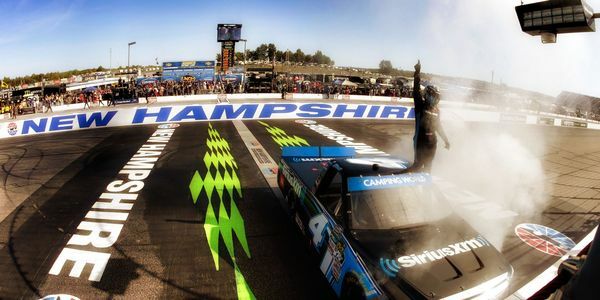 Bell led 73 of 175 laps on Saturday, becoming the first Camping World Truck Series driver in the last six races to win at NHMS from outside the pole position. It was however, the 10th straight Truck race at NHMS to be won from the front row. Truex was able to hang on for the runner-up spot, while Todd Gilliland, Grant Enfinger and Stewart Friesen rounded out the top-five - all four drivers did not qualify for the eight-driver playoff. "(Bell) has had the best truck all season," said Truex, the younger brother of Martin Truex Jr., the top seed in the Monster Energy NASCAR Cup Series. "I did everything I could to hold him off. We're just trying to win races and we are getting close. We'll get ours soon." Spots 6-11 in the UNOH 175 all went to playoff pilots. Led by Matt Crafton in sixth, Ben Rhodes, Austin Cindric, Johnny Sauter, Kaz Grala and Chase Briscoe round out spots 7-11. John Hunter Nemechek, who entered the Camping World Truck Series Playoffs in third, suffered a huge blow to his championship hopes when he was forced to the garage for a rear end issue in the opening stage. He would be able to make it back out, but ended up 36 laps down in 20th. The win for Bell guarantees him a spot in the next round, while Sauter (+25), Crafton (+24), Rhodes (+15), Cindric (+8) and Grala (+3) all sit above the elimination line. Briscoe (-3) and Nemechek (-7) will need a strong rebound next weekend at Las Vegas Motor Speedway to avoid elimination. ""I think a lot of our success over the last two years is because we came here and tested. That test has really helped us here at New Hampshire," said Bell, who now has five wins this season. "To be able to win the first race today means we can be more aggressive at Las Vegas and Talladega, which we couldn't do last year." Bell lapped more than half the field to take the opening stage. Bell, who started on the outside of Row 1 in second, led only 15 of the opening 55 laps, but pulled away from pole-sitter Noah Gragson late in the run. Rhodes, Gragson, Cindric, Sauter, Crafton, Truex, Gilliland, Enfinger and Friesen rounded out the top-10 after the first stage. Bell beat Crafton back to the Granite Stripe by more than three seconds to take the second stage. The Kyle Busch Motorsports Toyota pilot led 38 of 55 laps to dominate Stage 2. Crafton, Truex, Enfinger, Grala, Friesen, Rhodes, Gilliland, Justin Haley and Sauter rounded out the top-10 in the second stage. Gragson got loose between Turns 3 and 4 early in the second stage and bounced off Grala then Sauter, who took the brunt of the damage on the passenger side. Sauter's damage was minor, but he did lose his tailpipe midway through the stage and faded outside of the top-five.